I have to confess that I feel kind of silly writing up a homemade whipped cream recipe. It’s one of those things that you think everyone knows how to make, except that they don’t. I mean, I personally went 25+ years without knowing how to make it… I was clueless until my step-mom showed me how to make this same whipped cream recipe one afternoon. I made dessert for family dinner. Probably something like triple fudgy brownies, slow cooker peach cobbler, or cast iron blondies – this was a few years ago so I don’t quite remember what it was. Since baking is a learned skill, and we all have to learn from someone, I’m sharing with you today what my step-mom taught me! Before I give the step-by-step, can I quickly share WHY you should follow a homemade whipped cream recipe? Two words for you: hydrogenated oils. I know that there’s grace with eating real foods, and many people follow the 80/20 rule (where 80% of what you eat is healthy and 20% isn’t). But even so, hydrogenated oils and high fructose corn syrup have no place in a whole foods house. And unfortunately, the “whipped topping” that comes in a tub AND the stuff that comes in a can has one or both of these ingredients. I know whipped cream isn’t something we eat every day, but it’s so easy to make, why not take a baby step and start making it yourself? First, you start with heavy whipping cream. Not regular, not lite – HEAVY. Most heavy whipping cream at grocery stores nowadays contains carrageenan, a dairy additive you should avoid because it’s known to cause inflammation. Do your best to find heavy whipping cream that doesn’t have it, but if you can’t, don’t stress out over it. Second, you need your heavy whipping cream to be COLD. Not frozen, but you want it to be as cold as possible. This makes it possible to beat air into it and in turn, make light and fluffy homemade whipped cream. Third – and this is completely optional, but I’m including it because it’s what my step-mom did – you want your bowl to be cold too. My step-mom made sure to put the bowl of her stand mixer in the fridge at the slightest inkling that she was going to be making homemade whipped cream. Maybe it was because it was summer. Maybe she did it because that’s how she was taught to make it. Me though? Not so much. I almost always make my homemade whipped cream recipe using my bowl that is 100% room temperature. My whipped cream hasn’t suffered yet, but maybe one day I’ll try her trick and see if it’s any more delicious. You really truly only need one ingredient to make this homemade whipped cream recipe, and that’s the heavy whipping cream. 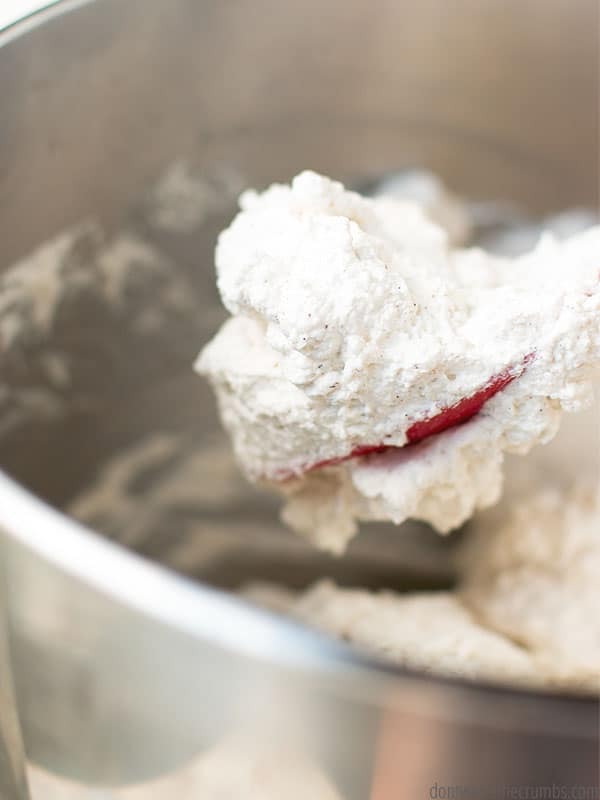 Some recipes call for vanilla or powdered sugar or cream of tartar… but you really don’t NEED any of those to make whipped cream. You just need heavy whipping cream. With that said, there are a lot of fun ways you can flavor homemade whipped cream and turn it into a really special treat for the family. I’m not saying to go crazy here by adding tons of sugar, but you always have the option of adding sugar to your whipped cream to sweeten it a bit. 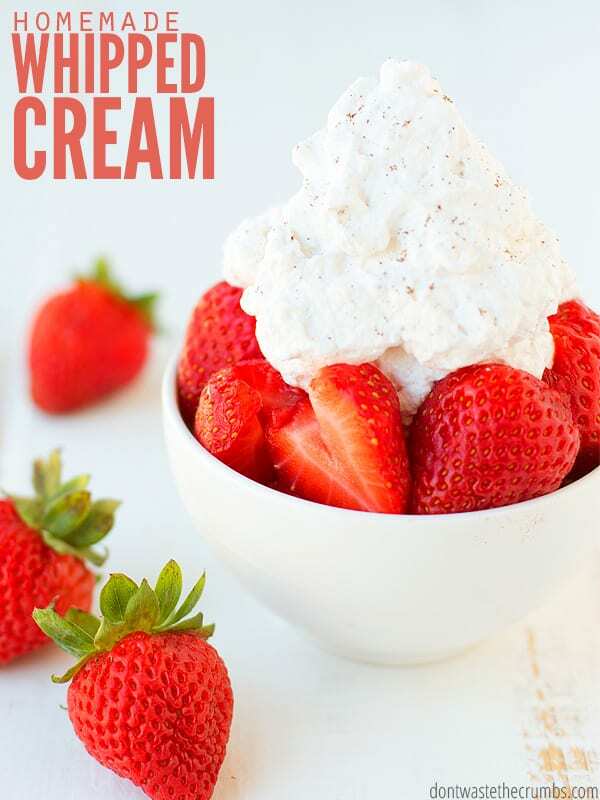 Adding up to 1 ½ teaspoons of various spices would be a super fun way to mix up the flavor in this homemade whipped cream recipe. Cinnamon, nutmeg, clove, ginger, vanilla bean powder… these all come to mind as great flavors to compliment holiday baking. Traditional homemade whipped cream calls for 1 tsp of vanilla extract, but what if you used almond extract or lemon or peppermint?! Imagine how much fun the whipped cream would be! I don’t keep many extracts in my kitchen because I prefer to cook with essential oils instead. I don’t rabbit trail down the issue of quality very often, but quality is vital when it comes to essential oils. I only buy oils from Young Living, who has an entire line of essential oils approved by the FDA for internal use (it’s their Vitality line). Click HERE to learn more about essential oils. Homemade whipped cream is best enjoyed immediately, although I’ve kept it in the fridge for a few days and the kids haven’t complained. Still, I recommend making this no more than an hour or two ahead than when you plan to serve it – the morning of serving AT MOST if you’re looking to impress people (a la Thanksgiving dinner or Christmas dinner at the future in-laws house). If you’re like me though and your plans to impress simply mean the kids putting their own plates in the dishwasher, feel free to make it the day before. I won’t tell anyone. 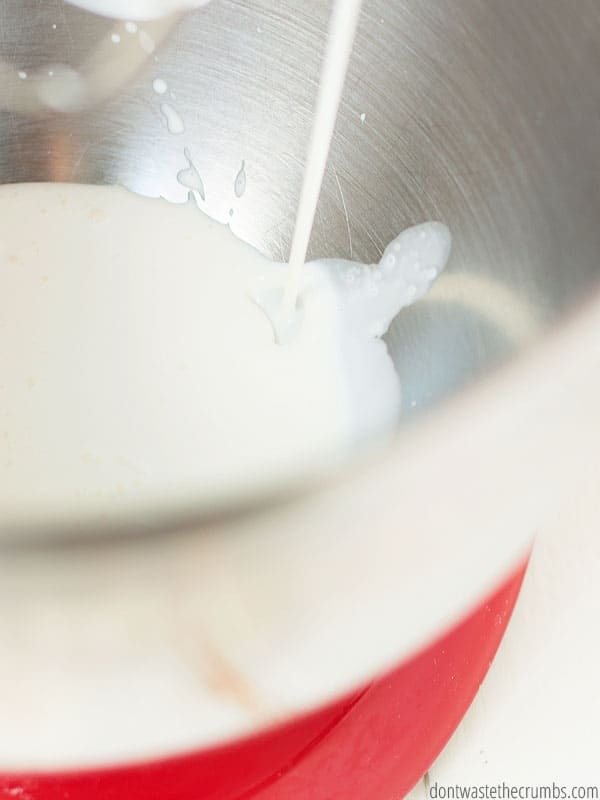 Pour the heavy whipping cream into the bowl of a stand mixer (I have this one), or into a large deep bowl if you plan to use a hand mixer. Set the mixer on the high speed and beat the whipping cream until it begins to look more solid than liquid. 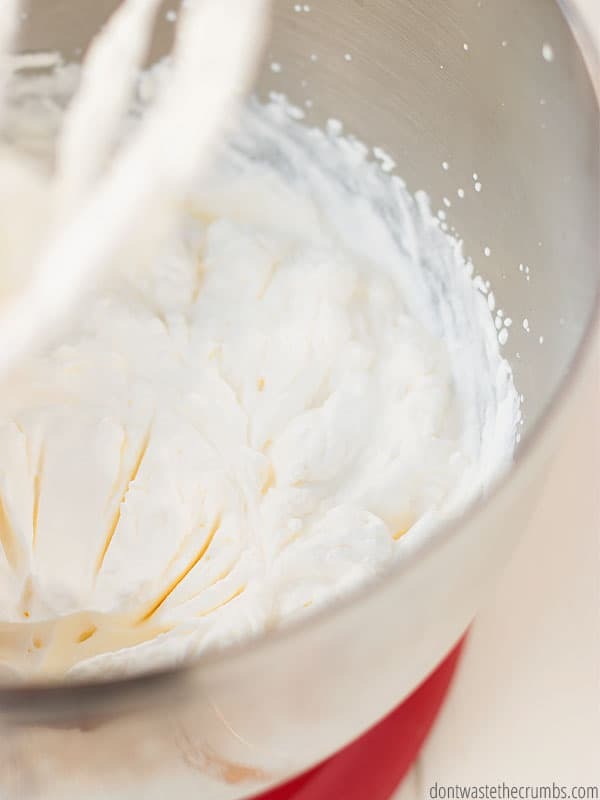 Continue beating until the whipping cream resembles stiff peaks when the attachment is pulled out of the whipped cream. Be careful not to over-beat the whipping cream. If you do, the whipped cream will lose it’s structure and not be as stiff. 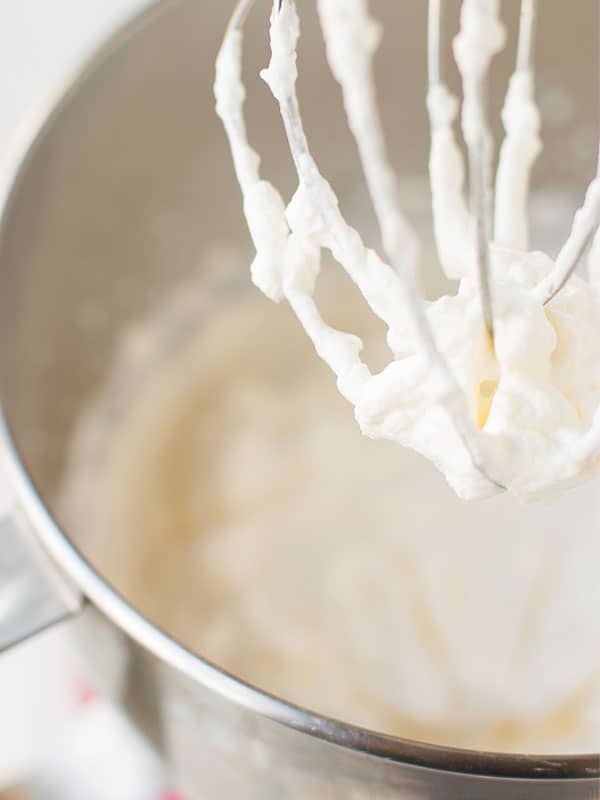 ** It’s perfectly fine and delicious to flavor homemade whipped cream, but remember the more ingredients you add, the heavier the cream will be and the harder it is to whip enough air into it. Err on the side of caution, especially with heavy liquids like honey and maple syrup. 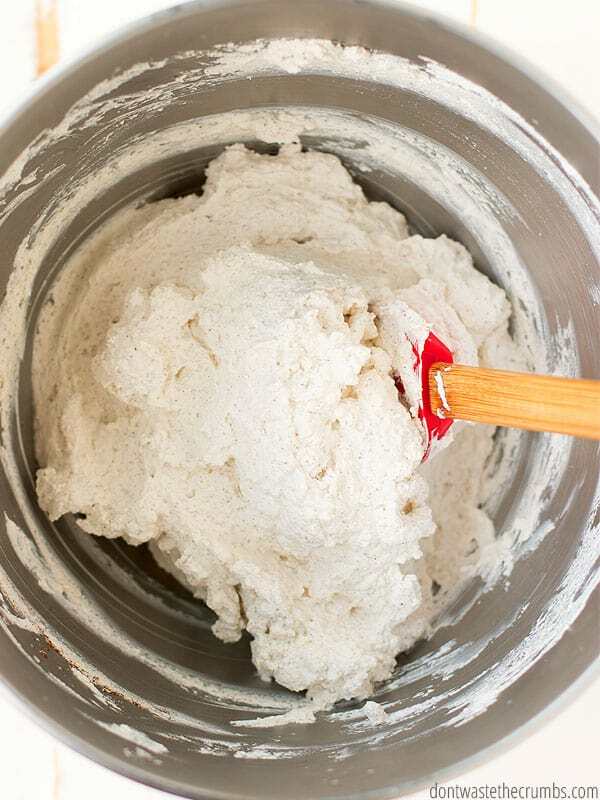 Have you ever made homemade whipped cream? Do you like to flavor your whipped cream recipe?